Dave Boehnlein serves as the principal for Terra Phoenix Design. He received his B.S. in Natural Resources & Environmental Studies from the University of Minnesota. Dave is also the education director at the Bullock's Permaculture Homestead on Orcas Island where he lived for seven years. With varied backgrounds such as organizational leadership, internship/apprenticeship program design, and trail work Dave brings a unique set of skills to the Terra Phoenix team. In the rainforests of Central America Dave learned about permaculture and tropical agroforestry systems. From there he went on to learn a wide variety of design and implementation skills with the Bullocks. Dave's freelance teaching services are highly sought after by universities, nonprofits, and other organizations. He offers Permaculture Design Courses through Bastyr University's Holistic Landscape Design Certificate Program and Alderleaf Wilderness College's Wilderness Certification Program. 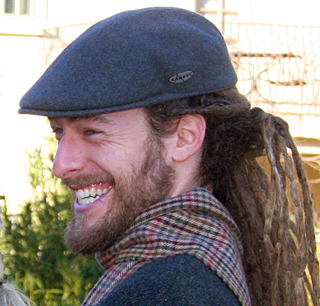 Dave is a member of both the Cascadia Permaculture Institute and the Permaculture Institute of North America. He holds a diploma in Permaculture Education and seeks to mainstream permaculture design with integrity. To that end, Dave teamed up with landscape designer and author, Jessi Bloom, and illustrator, Paul Kearsley, to write Practical Permaculture, an excellent entry-level permaculture design text. In addition, Dave is passionate about plants, especially weird but useful ones. Ultimately, Dave just wants to make the world a better place and eat really good fruit while doing it. Dave is particularly interested in education, the mainstreaming of sustainability, and keeping things organized.